Pacific Inns is proud to announce the newly opened Springhill Suites in Great Falls Montana, which is the first from the Marriott brand for the company. 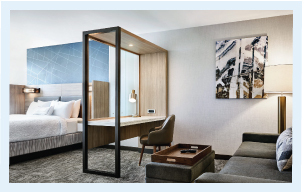 “The grand opening was a special celebration for the Pacific Inns team after working closely with the owner on all phases of the project,” said Linsey Forni-Pullan, Vice President of Pacific Inns. Managing the details even before breaking ground, like selecting the perfect location and brand, has led to the continued success the property is experiencing since the grand opening. “We are very proud to be part of each step,” said Forni-Pullan. Take a full video tour of this beautiful new property.